Relaxed Atmosphere in Beautiful Settings! Wickwoods is a Country Club, Hotel and Spa, 15 minutes drive from Brighton, just South of Albourne in West Sussex. It is set amongst 22 acres of lush greenery within the South Downs National Park. 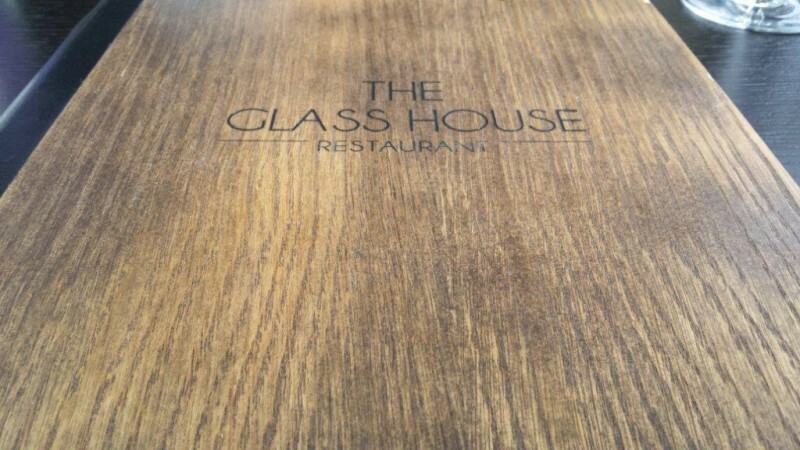 This is where you will find the award-winning Glass House restaurant, which specialises in casual dining and prides itself on using fresh, local produce. Before we went we decided to check it out on Trip Advisor and I’ve rarely seen such a favourable spread of reviews, it is clearly very popular. 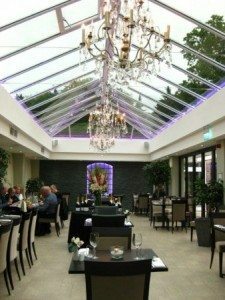 The restaurant is housed in a modern take on the traditional orangery and has large glass doors, which open out onto a lovely terrace, where you can eat if the weather is nice enough. 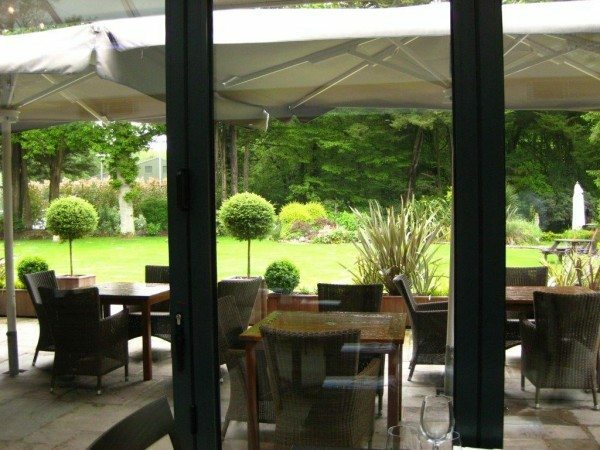 As you enjoy your meal you can gaze out across the immaculately landscaped gardens and beautiful mature woodland. 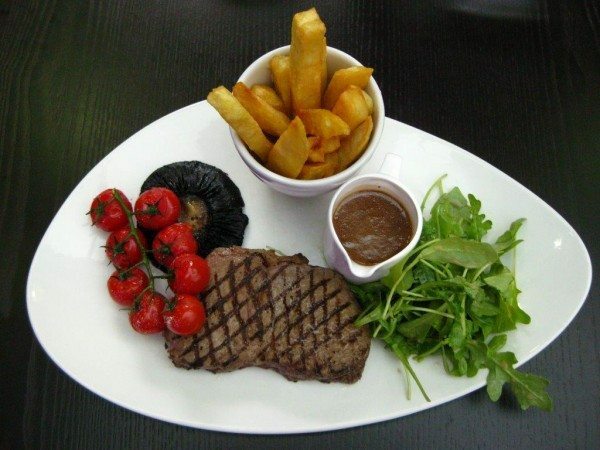 Alongside their varied a la carte menu, which should cater to all tastes, they also offer a set menu with two courses for £14.95 and three for £18.00. 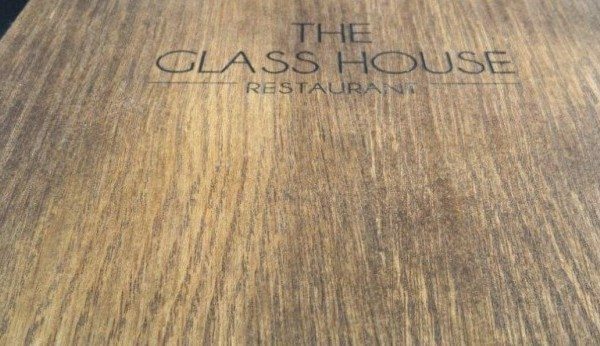 They do a splendid Sunday roast (see Georga Bullivant’s review) and, if the mood takes you, you can indulge in an afternoon tea (must be booked in advance). We were warmly greeted by Lisa who told us she had been working there, on and off, for 32 years, which we took to be a very good sign. We were introduced to our main waiter by name and I was personally led to the bathroom when nature called. The waiting staff were immaculately dressed and exceptionally polite. This is definitely the sort of restaurant where you close your menu and set it aside to invite the waiter to take your order. Service wasn’t rushed but nor were we left waiting. The tables were well spaced and attractively set and everything was spotless. The dress code is smart casual but the restaurant is warm, not surprising given the abundance of glass, so dress light. As the evening continued the restaurant became reassuringly busy and there was a pleasant hubbub of relaxed conversation, which, along with a mix of bluesy jazz including the likes of Norah Jones, made for a very pleasant atmosphere. 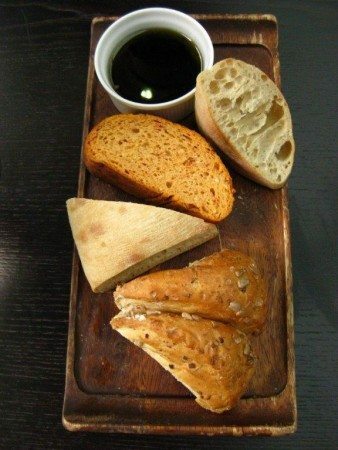 We decided to start with the selection of warm breads with rosemary oil and balsamic vinegar. 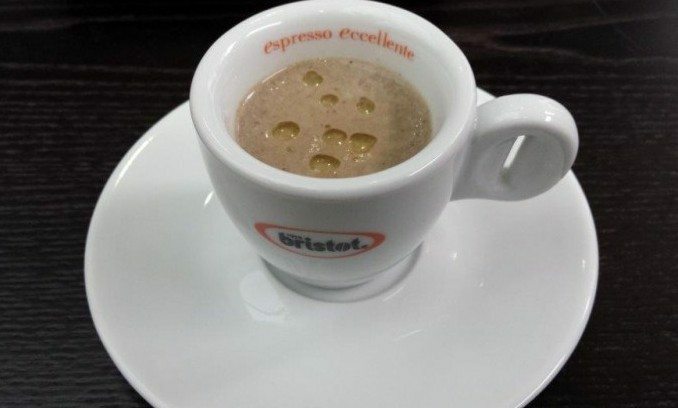 Before it arrived we were given an amuse bouche of white mushroom and truffle oil veloute served in an espresso cup. It packed a serious punch! It was thick and incredibly rich with an intense earthy flavour and a tangy kick from the truffle oil. It was a lovely surprise and a splendid start to the meal. When the bread arrived it was pleasantly warm and included granary, ciabatta and a sun-dried tomato loaf. The oil was subtly flavoured with rosemary, which added an original touch, and the balsamic vinegar was dark, unctuous, sweet and fruity, very nice indeed. 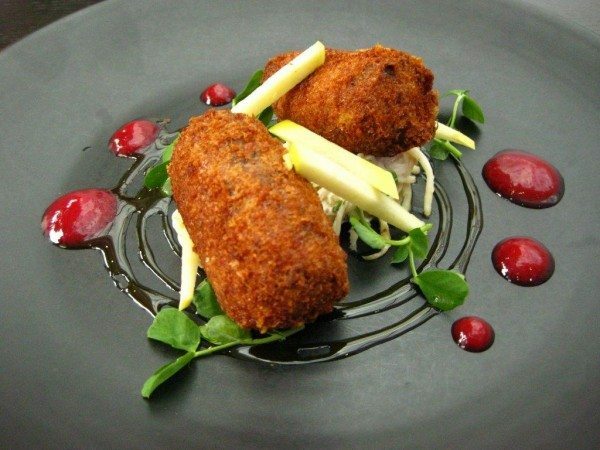 For his starter my husband Andrew ordered the confit duck leg croquettes, celeriac remoulade and orange and cardamom reduction. It was delicious! The coating was crunchy and golden without being greasy and the duck in the centre was moist, rich and very tasty. The accompanying celeriac remoulade was the best I have tasted, rich, creamy, crunchy and zingy. Yum! 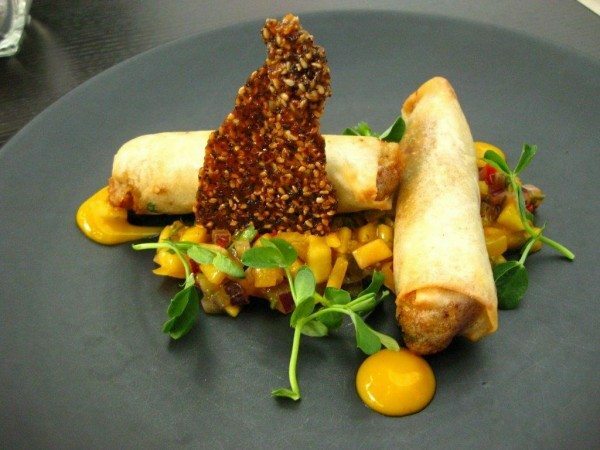 I had the crab and chilli spring roll, mango salsa and sesame seed tuile. Again it was delicious. The roll was crunchy with a moist filling of beautiful, delicate crab and the salsa was knockout! The mango was lovely and fresh and perfectly ripe, resulting in a delightful sweet, fruity, tangy salsa. It was crunchy with red onion and fresh with coriander and also had a pleasing warmth from red chilli’s. The sesame tuile was sweet, nutty and crunchy and added an extra texture to the dish. Both of our starters arrived steaming hot, were well-seasoned and stunningly presented on beautiful black plates decorated with vibrant fruit coulis and pretty little pea shoots. Clearly there is an artist in the kitchen. For his main Andrew had the 28 day aged sirloin steak, hand cut chips, mushroom, grilled cherry tomatoes and peppercorn sauce. The steak was griddle-cooked and was tender, succulent and well seasoned. It was nice and hot and medium rare as requested. The sauce wasn’t a traditional peppercorn sauce but rather a thick gravy with peppercorns, which went well with the chips. The chips were golden and crispy and the mushroom and tomatoes were fresh, juicy, and perfectly cooked. 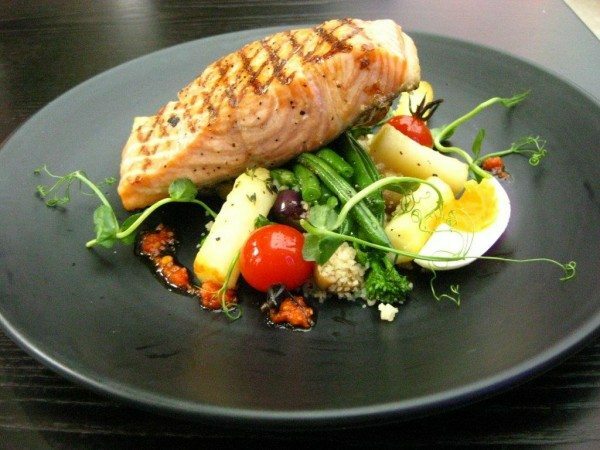 I had the fillet of salmon Nicoise style, confit potatoes, lemon cous cous and tomato pesto. The salmon was flaky and had a crispy skin and the cous cous was fluffy, light and very tasty, though I didn’t pick up on the lemon. The tender-stem broccoli and green beans were beautifully fresh and still crunchy and the cherry tomatoes were lovely and juicy. The confit potatoes were soft and tasty and it came with a beautifully cooked soft boiled egg, all of which made for a lovely colourful plate of food. For dessert I obviously *had* to have the trio of chocolate. Once again the presentation was very pretty. I was given a lovely smooth chocolate milk shake in a little glass milk bottle. It reminded me wistfully of the bottles of milk you used to get in junior school before Thatcher did away with them. I also got a rich, dark, chocolate delice, and a delicious, creamy, vanilla panna cotta. 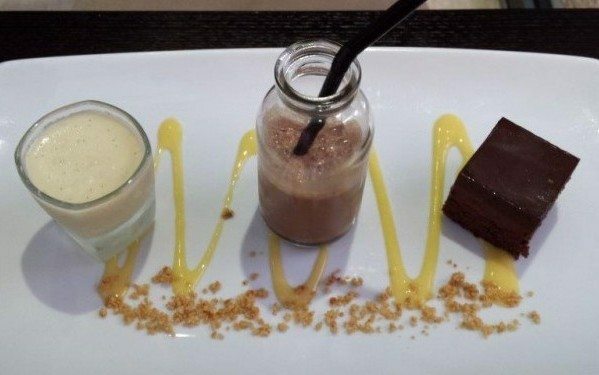 The dish was finished with an artistic squiggle of orange curd and a lovely toasted hazelnut crumb. Andrew went for the honey and rosemary crème brulee with honeycomb ice cream. 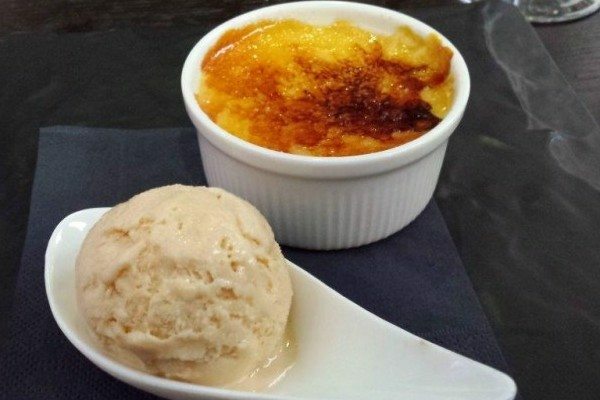 The crème brulee was thick and creamy with a crunchy caramelised top and had a subtle flavour of rosemary. The honeycomb ice cream tasted lovely and went well with the crème brulee. To drink, I had a lovely crisp Pinot Grigio and Andrew had a beautiful, rich, velvety smooth Merlot both of which were well-matched to our meals. I also indulged in a glass of their delectable dessert wine which was a gorgeous, deep amber colour and a fabulous, spicy, citrus flavour. What a wonderful finish to a delectable meal.